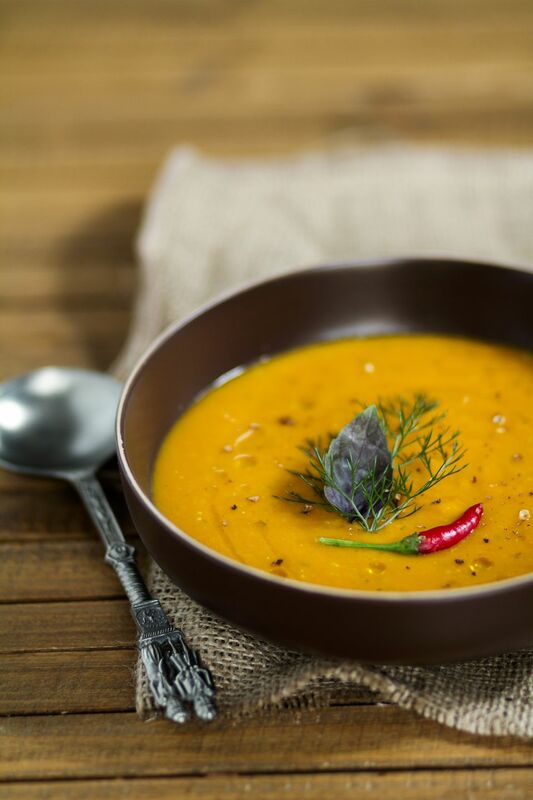 This recipe for creamy Thai-style carrot coconut soup with curry spices straddles both whole foods cooking and world cuisine; the spices possess both great flavor and anti-inflammatory and digestive properties that enhance those of carrots. Along with sweet potato, the carrot has a very high beta-carotene content. It’s rich in vitamin K, vitamin C, and other antioxidants. Carrots are alkaline; they clean acidic blood and are considered an anti-cancer food. Onions expel excess mucus from the body and are healing for the lungs. Not your ubiquitous carrot soup, this dish possesses layers of flavor that complement its healing properties. We like this soup with an accompaniment of Cucumber and Mint Salad on a bed of greens, or crisp Fennel and Orange Salad. Warm olive oil in a soup pot over medium heat. Add onion, sweet potato, and garlic, and cook 5 minutes, stirring occasionally. Add the ginger, coriander, curry spice, bay leaf, and kaffir leaves, and cook the mixture 2 minutes, stirring frequently. Heating the spices before adding liquid helps release their full flavor potential. Add the carrots and broth, along with an additional 2 cups of water and 2 large pinches of sea salt. Bring to a boil, reduce heat, and simmer for 30 minutes, until the carrots are very tender. Remove soup from heat and discard bay leaf and kaffir lime leaves. Puree soup with a vertical blender until creamy. Whisk in the coconut milk, and if necessary heat to serving temperature, taking care not to boil the soup. Adjust seasoning and serve garnished with the Thai basil or cilantro leaves. Notes and Variations: Ginger and curry spices possess significant anti-inflammatory properties, and kaffir lime and lemongrass are both digestive tonic plants. For a spicy variation on this soup, substitute the sweet curry powder with 1 teaspoon of red Thai curry paste. Dissolve the paste in a bit of hot water before adding to the soup.